I figured it was time to replace my Cannondale Roams that I have been riding with for the past three seasons. The base of the soles near the cleats were starting to fray and I couldn't keep them tight enough so as to keep out dirt and rocks from riding. With the proceeds from the sale of the Cannondale, I headed over to Straightline Bikes in New Milford the other day and picked up these Louis Garneaus along with and another pair of Crankfire socks. What I like about these shoes right off the top is their stiffness in the sole. The Cannondales probably started out stiff but over the years loosened more and more. They are still good and will probably where them from time to time but the Louis Gs are now my main shoe. They feel really good. The funny thing is when I was trying them on, I tried the 44s which is supposed to be 10.5 but they were too tight. Ended up getting the 45s, which I believe is a size 11 by use standards. I am glad I didn't try to get these or any other shoe online and have to go through this guessing game of shoe sizes. I tried them out initially on the Bianchi and found clipping in to be a challenge so I took the cleats off and installed the shim that comes with the cleats and that made all the difference. Later in the day I headed out on the 'Horse to give the new shoes a thorough test and they were great. In fact, what better way to break in new shoes than to do a little a TM along the way. I decided to do something about the one stream crossing on the Mulikin Trail that I hit on the past two rides and got thoroughly covered in mud. I should have taken a picture of the new crossing but I was running late and did not. It rides like a skinny because it's one line of rocks that I pulled from all over. This fall I will try to widen it with more flatter rocks but for now it's passable. Of course the new shoes got to taste a lot of mud and dirt while assembling this new crossing. 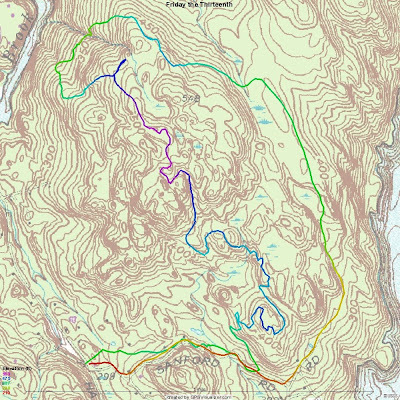 Below is a pretty accurate profile of the Upper Gussy Trail. 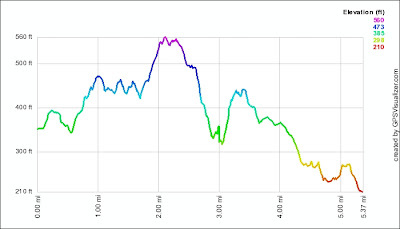 Of course, I thought the trail was much longer than 1.7 miles but this profile, at least for elevation, seems pretty accurate in comparison to the topography maps. Here is a map of today's ride - kind of looks like a Dinosaur. Basically it's the Echo Valley Loop with a section of the Mulikin, and then climb back to the fire road, and then do the big climb, which I am not 3 for 3. I guess I need to take the Fetish out and see if I can climb it with that bike. In it's current configuration, rigid 69er, I don't think I have done it yet. Maybe on Sunday, I will take it out and see about trying the climb. The Fetish has been sitting in the garage with the rear wheel off for a couple of weeks now. I think it's about time I put it back together and get some more miles on the bike. Again, another wacky profile. In fact, it's backwards. Not sure why that is happening, have to see if I am doing something wrong on GPSVisualizer. Higher elevations are pretty accurate this time around but on the final back down Sanford and Tamarack showing a much higher elevation is way off compared to the way in. I think it might have something to do with speed because on the way out I was moving.